In this PDF you’ll learn how Drillinginfo (DI) provides accurate, current rig data in the Permian Basin. From permitting and leasing information to rig locations and pricing trends, you’ll find products and solutions to help transform how OFS companies drive leads. Tracking prospects can be a lucrative opportunity, but rigs move on a daily basis, so you need the latest information. See how DI can drive a company’s success by gathering up-to-the-minute rig intelligence from a single, comprehensive software solution. The Permian Basin Play is seeing a surge of O&E activity, with reports indicating that almost 30% of future oil reserve growth in the U.S. will come from the formation. Does your oilfield service team have an innovative approach to your data source detailed enough to support competitive decision-making? See how to get the most accurate, timely drill-site and well event information to make better, faster decisions and drive the best leads — that can turn into opportunities. You’ll also see how to save your team valuable time and resources with the DI Rigs Mobile App. Easy access to rig coordinates and driving directions are available via GPS units located on over 1,800 rigs, with information coming directly from the drilling contractor or state agency, and updates are made daily. When you see a rig via DI Rigs Mobile you’ll know that the rig was there that morning, and you’ll have actual driving directions to its precise location. 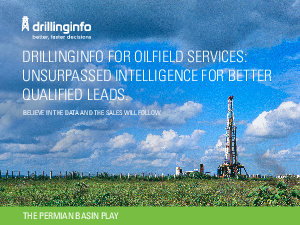 To make smarter, faster decisions based on unsurpassed rig intelligence in the Permian Basin, download the PDF here.